With the weather getting warmer (finally) in Western Washington my mind has been drifting to fresh clean flavors. One of the things I love about Greek food is the flavors and tzatziki sauce is one of my favorite things. The taste of fresh cucumber and dill with a little pop of garlic? Mmmm so good. So now I have been trying to come up with a few Greek inspired meals. One of those meals will be a Greek burger for #sundaysupper. If you don't follow me on Twitter give me a quick follow and keep an eye on that hash tag this Sunday. You will find so many wonderful recipes, many of which get picked up for the top 9 on Foodbuzz. It is wonderful being included in such a terrific group of bloggers. So today's post is the sauce that is part of many a delicious Greek meal. 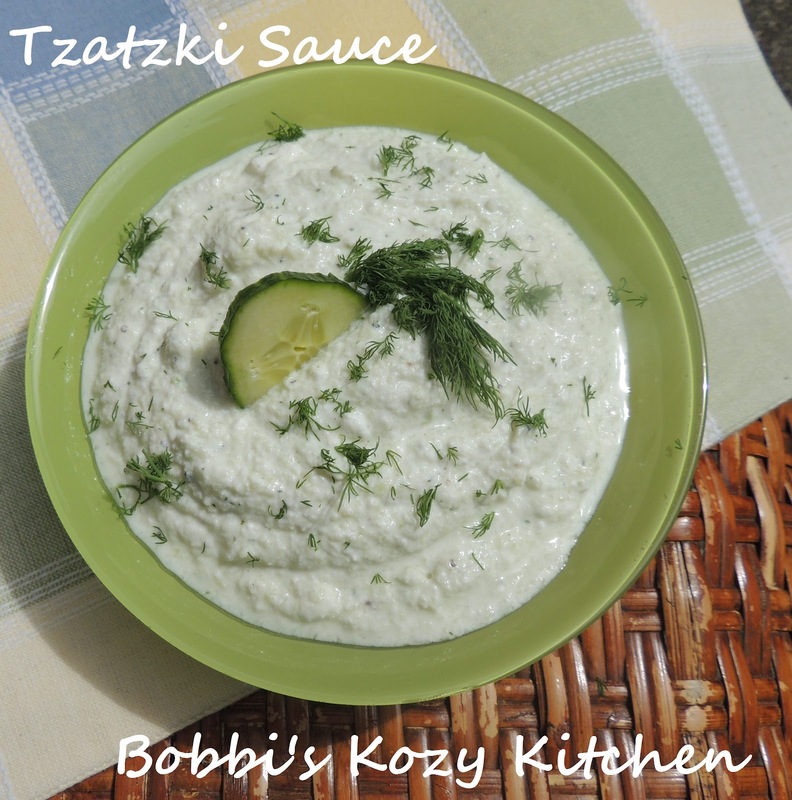 Tzatziki sauce. This recipe couldn't be simpler and is so flavorful. You can use it on burgers, chicken, sandwiches, or even just dip fresh vegetables in it for a snack. It is very healthy as well. It calls for Greek yogurt, but you can use regular yogurt if you can't find Greek style. You just have to drain it first. Place it in a strainer lined with cheese cloth over a bowl and allow it to drain for a couple of hours to get as much liquid out of it as possible. Gather your cast of characters. No that isn't a weird cucumber, I just started peeling before I took the picture. I get carried away sometimes. Oops don't forget the lemon! Peel your cucumbers and scoop the seeds out with a spoon. Cube it up and toss it in a colander with a little of salt so it can lose a little bit of that water weight. Now drop your skinny cucumber into the food processor. Add your garlic, dill, lemon juice, and ground pepper to the party. The result? Some darn tasty sauce that you will want to dive right in to!! Peel the cucumbers and cut them in half. Using a spoon carefully scrape the seeds out. Chop the cucumbers and lace them in a colander, salt them and allow to sit for at least 30 mins to allow the cucumbers to release their liquid. Add the drained cucumbers, garlic, dill, lemon juice, and black pepper to the food processor. Process until smooth. Stir cucumber mixture into the yogurt. Taste and adjust your salt and pepper if needed. Place in an airtight container and allow to set in the refrigerator for at least 2 hours to allow the flavors to meld. Can be stored for up to 2 or 3 days. Should be used as quickly as possible because the cucumbers will give off more liquid and the sauce will separate. I love Tzaziki and would put in on everything given the chance. We typically don't see it with dill around here and I usually leave the dill out, but I have tried it both ways and is always delicious! Thanks Lane, yesterday was the first time Kevin really tried Tzatziki and fell in love with it too!! One word - delish! I like the addition of fresh dill too. Thanks Amee, I could too!!! I hope you like my Pesto Stuffed Pork chops this week. They are baked and oh so good! !